Altair's Inspire 2018 simulation-driven design software enables engineers to rapidly assemble and simulate dynamic mechanical systems to automatically resolve loads on system components for optimization and analysis. Globe Newswire Photo /Altair Engineering Inc. The company followed up its release of Inspire 2018 with its acquisition of TES International's software. 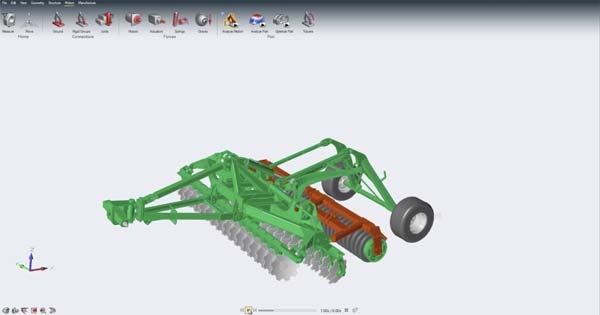 TROY, Mich.–Altair recently released its Inspire 2018 simulation-driven design software, which the company described as a milestone in its development of generative design, optimization, and simulation software. Inspire 2018 is available through Altair's solidThinking channel partner network and directly to its HyperWorks user community, the company said in a press release. "Inspire 2018 enables designers and engineers to leverage simulation in new and inventive ways to accelerate the development of high-performance, innovative products," said James Dagg, CTO for User Experience at Altair, in a press release. "Inspire integrates well into large manufacturing enterprises for rapid simulation and light-weighting insights, and has an intuitive user experience that is ideal for small and medium-size businesses with little or no simulation experience." Applied at the very beginning of clean-sheet design programs and for design exploration of current production parts, Inspire 2018 simulation-driven design software is said to allow designers and engineers to rapidly assemble and simulate dynamic mechanical systems to automatically resolve loads on system components for optimization and analysis. Designers and engineers can also generate weight-efficient design proposals unique to specified conventional or additive manufacturing processes with Altair's topology optimization technology. They can also simulate the performance of competing design concepts for static loads, normal modes, and buckling, and directly export Inspire CAD geometry to 3D printers to produce high-performance, quality parts, the company said. "In order to stay competitive while pushing the innovation envelope, simulation must drive the entire design process from the early concept design phase all the way through to production," said Inspire Program Manager Andy Bartels, in the press release. "We continue to add tools to make Inspire more beneficial to its users in each step of the design process." ElectroFlo thermal analysis software incorporates coupled thermal/electrical algorithms that are said to improve the accuracy of analysis results for systems containing wires and traces. Its applications, including the Bussed Electrical Center (BEC) shown here, range from consumer electronics to automotive. Globe Newswire Photo /Altair Engineering Inc.
Inspire 2018 is reported to include new advancements to generate optimized lattice and mixed solid – lattice structures, visualize simulation results in 3D, and export lattice designs in .stl file format for 3D printing. Users can view and interactively assign loads to load cases and import and export design loads in .csv file format with the new Load Cases Table. They can also design for additive manufacturing with overhang shape controls to help reduce overhangs to create more self-supporting structures, and can automatically optimize the fit of PolyNURBS CAD geometry to generative design results with the new PolyNURBS Fit Tool. "Inspire 2018 is available immediately to clients as an application software download, and later this year as a cloud-based offering," said Dagg. "Branded as Inspire UnlimitedTM, the cloud offering of Inspire will include additional functionality, such as secure data management, team collaboration tools, and on-demand high-performance computing (HPC)." Shortly after Altair released Inspire 2018, the company announced that it had acquired Michigan-based TES International's technology, including ElectroFlo CFD (computational fluid dynamics) software, an electronics cooling package designed for high power-density applications. ElectroFlo is described as efficient thermal analysis software that combines the power of coupled thermal/electrical analysis with a user-friendly graphical interface to provide solutions for complex problems. It incorporates coupled thermal/electrical algorithms that are said to improve the accuracy of analysis results for systems containing wires and traces. The software can be used to simulate electronics ranging from components and printed circuit boards to full systems, and is particularly useful for designing high-current applications, the company said. "As an advanced electronics thermal management software package, ElectroFlo is fundamentally based on a multi-physics and multi-discipline solution methodology," said Dr. Ben Zandi, former founder, chairman, and CTO at TES International, and now vice president of software development for thermal solutions at Altair. "For this reason, Altair, with its unmatched offering of innovative technologies, provides the ideal environment for ElectroFlo to flourish. Combining it with AcuSolve can provide thermal solutions for applications with complex flow interactions, while coupling with Altair's Electromagnetic Compatibility (EMC) and Electronic Design Automation (EDA) technologies will provide users a broad set of solutions for electronic applications." "ElectroFlo is a great extension to our thermal simulation portfolio," said Dr. Uwe Schramm, CTO at Altair. "There is a lot of synergy with AcuSolve 3D CFD, which has been widely used for thermal management in a multitude of use cases. Having Dr. Zandi on board will accelerate our work in a number of areas, including electronics applications supported with electromagnetics simulation using Flux and FEKO." Altair (www.altair.com) focuses on the development and broad application of simulation technology to synthesize and optimize designs, processes, and decisions for improved business performance. The company is headquartered in Troy, Michigan, and operates 69 offices throughout 24 countries.